from 73 years ago this month! It has these lovely illustrations of men’s holiday fashions in ice-cream colours which really caught my eye. Just one month later WW2 was declared. Inspiration hit and I made…. wait for it…… more french knickers of course. Serendipity in the form of some lovely soft turquoise-y blue silk broadcloth I bought only the week before. To make lace appliqué bows you tie a length of lace into a bow and fiddle about with it on your ironing board sticking pins in here and there until it has the shape you like and then you press it very flat. Carefully re-pin it in place on whatever you will be sewing it on. Flat fabric is easier than an already sewn garment because of having to turn it every which way while sewing. You can either hand baste it in place first (the methodical way) or go straight to sewing it down (the impatient way) though the pins will really get in the way. I used a small size 2 straight stitch and was very grateful my machine has a presser foot knee lift! 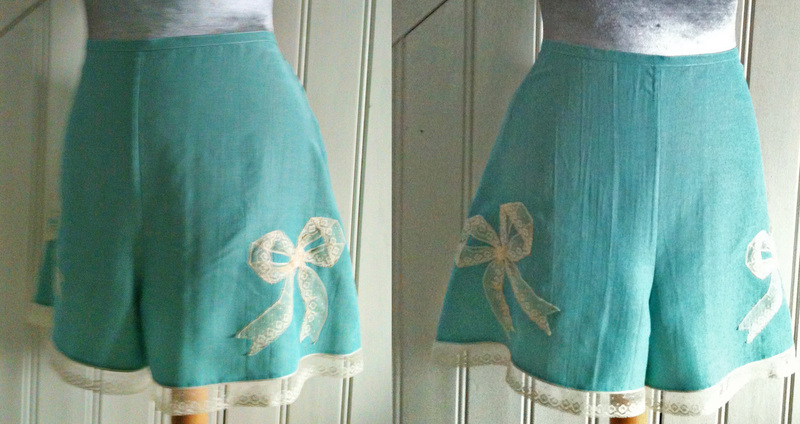 You could cut some sections of the backing fabric away after sewing which would look lovely and airy- in which case either a tiny machine zig-zag or close hand-whipping the lace edges down would be better. The magazine also showed some gorgeous 1939 hair style inspiration with a little how-to…. It’s a real bumper issue: including beautiful illustrations forecasting 1939/1940 women’s winter fashions, cute knitwear to make for little girls…romantic stories that my french just isn’t good enough to read. Honestly I haven’t enjoyed a magazine so much in ages. And lastly the advertisement for Laughing Cow cheese caught my eye. I remember loving it as a kid but didn’t know it has been around quite so long. Don’t you think the 1939 version has a cheekier expression than the modern one? Would you mind if I printed off the picture of the ‘vintage’ Laughing Cow to show to the other people in the French conversation class I attend? Just for general interest – last time I brought in some comic French verses I found on the internet and I think they were a bit too ‘silly’ for our teacher. I just happen to have a quirky sense of humour. Well I was young when ‘Monty Python’ was ground-breaking and fresh. Did you see Eric Idle in the Olympic closing ceremony? I thought he was the best bit! The Laughing Cow design goes back to the 20s, based on an illustration by Benjamin Rabier. His Gedeon series of albums for children often involved animals getting up to all manner of mischief and inflicting dark, horrible things upon each other. I’m not surprised the Cow’s expression has been sanitised and I think the more sensitive of modern, animal loving audiences would find his drawings very weird, if not quite upsetting these days! Those French knickers are gorgeous and look so luxurious. That colour is beautiful. Thank you so much for that info !! I looked him up, benjaminrabier.com if any one else cares to, a nice little selection of his work there. And anyone who has read The Famous Jimmy by Enid Blyton in their childhood will have seen his illustrations in that. I think he did wonderful illustrations, some are certainly a bit weird but many just the sort of thing I do like. Interesting that Tintin may really have come from a character, or certainly been very inspired by one of his. He died in 1939 too. Ooh, I’d never heard of The Famous Jimmy so that’s one for the bookshelves! I’m assuming it’s adapted from the Gedeon albums – which I adore, weirdness and all, having grown up with my grandmother’s very battered copies. And thank you for mentioning the benjaminrabier.com website which I didn’t know. I’ve just discovered that La Baleine salt which is still used to this day in France also uses an illustration of his! You can never have too many lacey bibolets…. The old red cow looks more evil I think!! Because she knows one triangle of that cheese is never enough enough…see comment about waistlines below! what a great find and how nice that it has somehow survived this long…what a great tale it might have to tell.I just love the hairstyles and wish if only I could fiddle about and get mine to go like that.I have recently been watching on Youtube some obscure-ish films from the mid-30’s and just drooling over the hairstyles and dresses.Love the french undies too…gorgeous colour. I really enjoyed this post, and thanks for the tips on the lace! 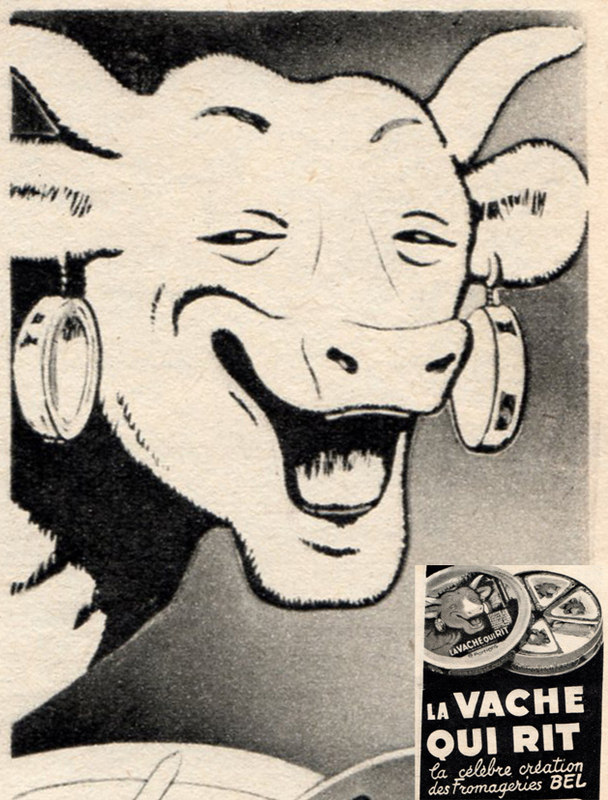 That vache’s expression is positively smutty. Your drawers are gorgeous! I really must get round to making up your pattern! This knicker pattern is a new DIY drafting tutorial I hope to get up very soon… the circular knickers drafting pattern I already put up makes much airier knickers than most women expect…even though it says ‘circular’. This new one is more likely what you want! My Mum hitchiked around France in her late teens just after the War and said she and her friend survived on croissants and La Vache Qui Ri (?) ! The magazine is a lovely prelude to the darkest times in Europe last century, thanks for sharing.